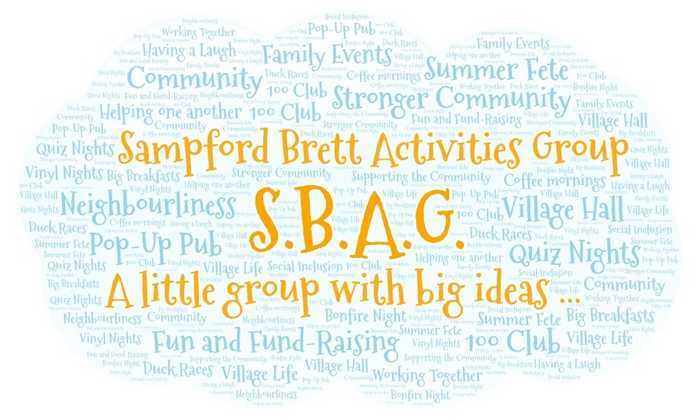 Sampford Brett Activites Group (SBAG - pronounced SPAG as in Spagbol - you had to be there ...) is a group of villagers who get together to organise fun social and fundraising activities and events throughout the year. We try to keep things as informal as possible, but obviously we have to keep within certain guidelines, and so we do have a constitution. We organise a programme of events that balances both fund-raising and social needs; it's as much about getting people together as it is about raising money . . . but clearly we do need to raise money for a variety of things, and in particular the current discussions about the future of the Village Hall (the Acorn Group) will likely lead to some challenging financial targets! monthly (mostly) "Pop Up Pub" nights in the village hall where a selection of fine wines and ales is available for purchase, normally accompanied by an event of some sort, often involving food! Details of activites are listed on the Events page of the website. We're always looking for new members and new ideas so don't be shy - this is what village life is all about!